I want to like the Ineke series but I'm trying them in order and I'm still waiting for the big revelation, the fantastic scent: Chemical Bonding, the third in the series, is not it. Part of the problem is my nose, I guess: the scent just doesn't smell uniform, but presents itself in an unpredictable way. Sometimes it smells like a lot of synthetic peonies with a faint overlay of citrus tea, which is not for me, and other times it's a cup of citrus tea with a few peony petals in it, which is nice enough although not really unusual or special: tea scents are a dime a dozen, alas. 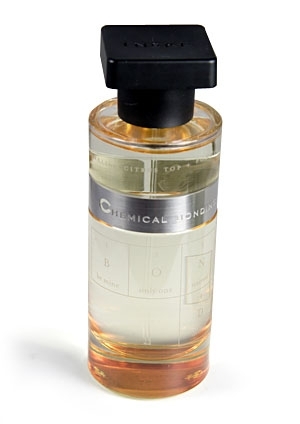 Some people dislike the name but I think it's clever: it doesn't make me think of synthetic chemistry (though it wouldn't bother me if it did, because everything is chemicals, water's a chemical), but of the mysterious attraction that fragrance can generate between two people. And of course the packaging is stellar, with periodic-table symbols etched into the bottle (they spell the word BONDING*) and echoed on the box. When the packaging is better than the scent, though; isn't that a problem? *The pedantically precise and the science geeks (how much overlap there is between those categories of people) will have noticed that it is not possible to spell the word BONDING using elements from the periodic table. You can start with boron, oxygen, neodymium, iodine, and nitrogen, but there is no way to get that terminal "g", unless you are willing to put up with an extra letter; germanium will give you BONdINGe, sort of like Monty Python's "Ministry of Housinge". 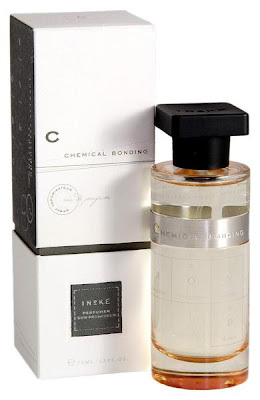 I briefly sniffed some of Ineke's scents from a friend's sampler set..No obvious loves- but to be fair- I need to explore in more detail..
Yeah, I've tried four of them so far, and nothing special at all. I don't think we should cut niche perfumers extra slack just because they're independent; they still have to be good.